Click on the button above to donate online to the Catholic Arkansas Sharing Appeal, which supports religious vocations, Catholic schools and charities, faith formation, Hispanic ministry, diaconate formation, our tribunal, pro-life activities and much more. To learn more, go to "What is CASA?" 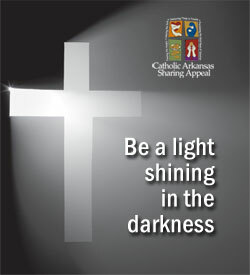 Bishop Anthony B. Taylor kicks off the annual Catholic Arkansas Sharing Appeal (CASA) Feb. 2-3 in parishes across the Diocese of Little Rock with a recorded homily to be played during all Masses (in video or audio format). Pledge envelopes are also handed out asking parishioners to meet this year's $2 million goal. This year's theme is: "Be a Light Shining in the Darkness." Talking about the ongoing darkness facing the Church, the bishop pointed out in his homily, that no matter how dark it gets, the light of Christ overcomes "any darkness we will ever have to face." "As you know, our diocese and the Church at large have been going through our own stretch of darkness this last year, and there are wounds we want to help heal, darkness we want to help lift, wrongs we want to help set right," he said. 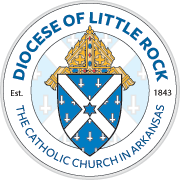 Catholic Arkansas Sharing Appeal (CASA) began in 1990 to provide critical funding for the pastoral, educational and social needs of the Diocese of Little Rock. Through the generosity of Catholics our diocese, we have been able to help the poor, developing parishes and our Catholic schools to continue their ministries in promoting the teachings of Jesus. Donations have also helped to educate deacons, lay ministers and seminarians as well as make all ministries of the diocese a success. See What Your Donation Can Do or find a list of ministries supported through CASA by reading Arkansas Catholic. At the start of the CASA campaign, parishioners are asked to turn in their pledge/gift envelopes, indicating their total gift and the method through which they will give it. They may choose from a one-time gift or pledge to be paid in monthly installments until the total gift is received. Donors may pay by check or credit card. To learn how to give to CASA, see Options for Giving. If you wish to donate online, go to Online Giving. Download the following resources for use in your parishes. If you have any questions about these materials, e-mail Dianne Brady or call her at (501) 664-0340, ext. 391.